Buy 1 for $7.26Buy 2 / Save $0.39!Buy 3 / Save $1.45! 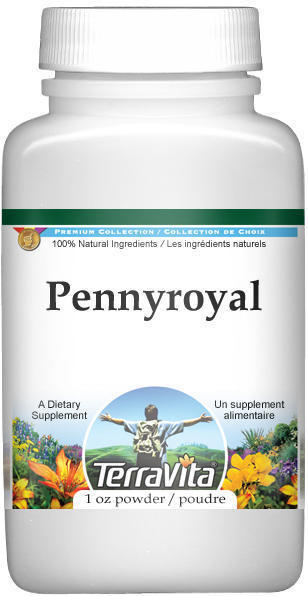 Pennyroyal - There are two plants of this name: one is English Pennyroyal or Pudding Grass (Mentha pulegiutn) and the other is Pennyroyal or Squaw Mint (Hedeoma pulegioides). Both are very strong and pungent with a clean, cool, refreshing, minty odor. Propagation: by seed, slow to germinate from sown seed but self-sows freely; English by seed, by division of roots in fall or spring. English - Prostrate in habit, stems about 14 inches long, leaves are deep green, somewhat hairy, and oval in shape, about 1/2 inch long, tiny lilac-colored flowers in axillary whorls, useful ground cover in warmer climates but apt to winterkill in cold climates, plant can be taken up for a trailing house plant. Spacing of Mature Plants: From 5 to 6 inches. Cultural Requirements: English likes clay, moist soil in partial shade; prefers light, sandy, dry soil in full sun. Whole Plant: (Health) in infusions to produce perspiration, used in colic, emmenagogue; English in infusions for spasms, an emmenagogue.